Polaris Office Tips: Connect with Different Clouds! 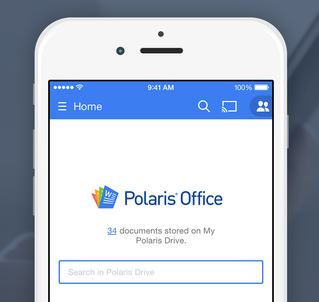 Are you using Polaris Office on your phone but all your files are stored in OneDrive, Google Drive, or Dropbox? Here’s a tip. Not only can Polaris Office view and edit documents from third-party office suites, but it can also connect to major third-party cloud services to access your files that are not stored in your Polaris Drive. – Improved interface and design of Signin/Signup screen. 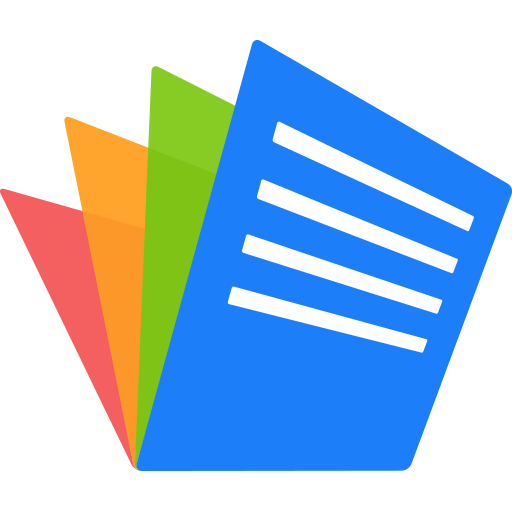 – Improved design of document list for convenient management. – Added notification alarm that appears when premium service ends and get-more-storage mission is completed. – Fixed other known bugs submitted to customer support. ■ Updating the latest version! For any inquiries, send via “Setting > Customer Support” and we will reply back as soon as possible. Make your day easier with Polaris Office! Polaris Office can help you work more efficiently and effectively. Check out some real ways to utilize Polaris Office. View the marketing proposal that was sent from the overseas office last night on your commute to work. 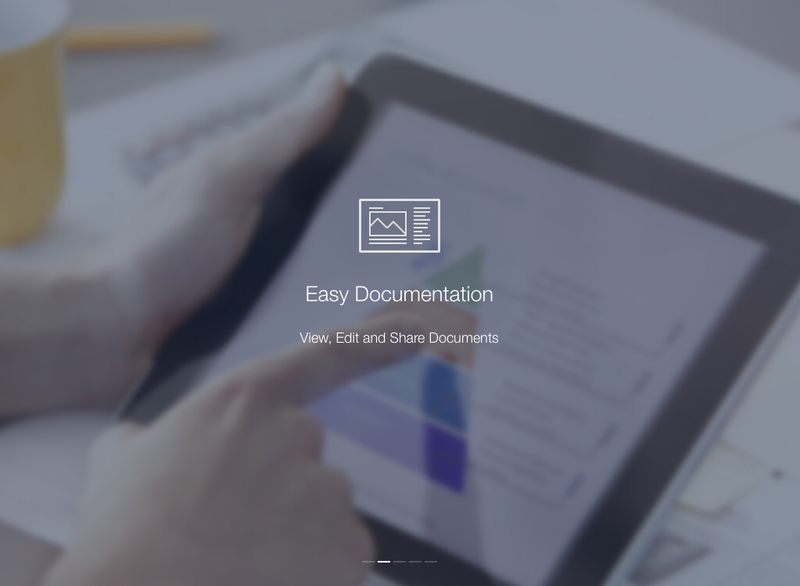 Walk into your meetings and record proposal notes on a new document and share it with your team. All shared devices are updated to the latest document version so it allows everyone to view the most current revisions. After you and your boss stop by a café after lunch, your Boss suggests a few changes to your upcoming presentation. Simply open any other Polaris connected device like your tablet and revise the presentation on the spot. After returning to your office after the presentation you can summarize the meeting and share your notes with your colleagues. As you or others add more notes to the document, all shared users will see the updates instantly. Even after coming home from work, you can sit down at your own computer and review your meeting notes from the day. Every workday is busy, and time is your most invaluable resource. Don’t waste any more of it. Using Polaris Office’s auto sync function for up to 5 devices you can access synced documents on your Office Desktop, Smartphone, iPad, Laptop, and computer at home. Always be able to access your important documents on the go. View, edit, and even share your important files anytime, anywhere. You can share through, your address book, email attachment, or as a link. Even if there is revision made in shared document, it is automatically updated to the most recent revisions so you don’t have to sync your documents again. Work smarter not harder on all your devices with Polaris Office! 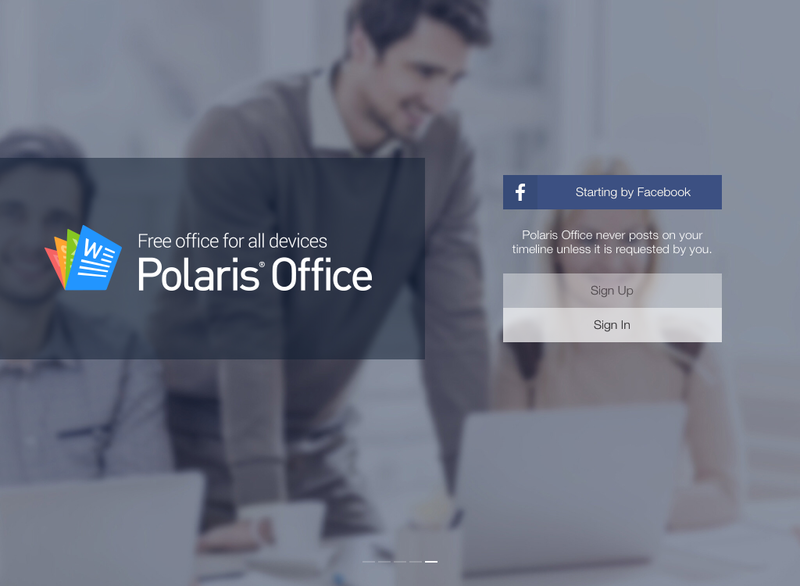 If you have installed Polaris Office on your phone or tablet, you can install Polaris Office Sync onto your desktop computer as well! 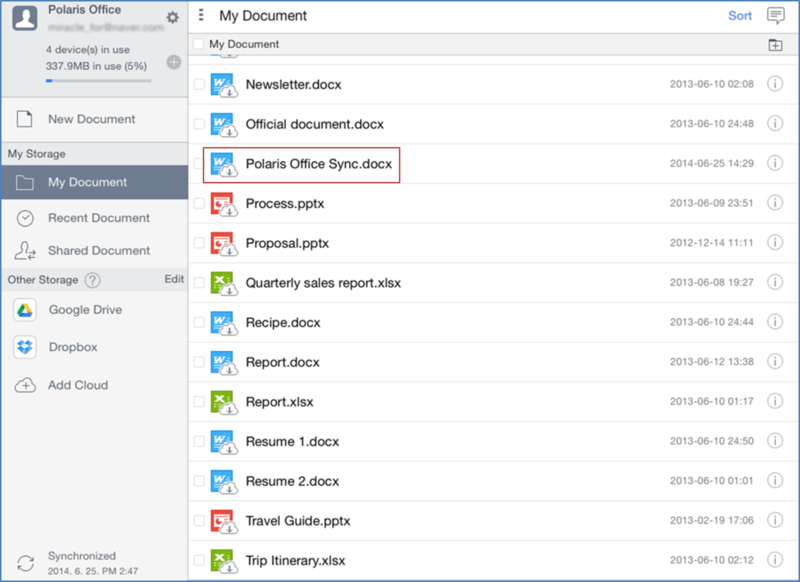 This guide will take your through the steps to set up your Polaris Office Sync program to manage documents more efficiently. Tip! 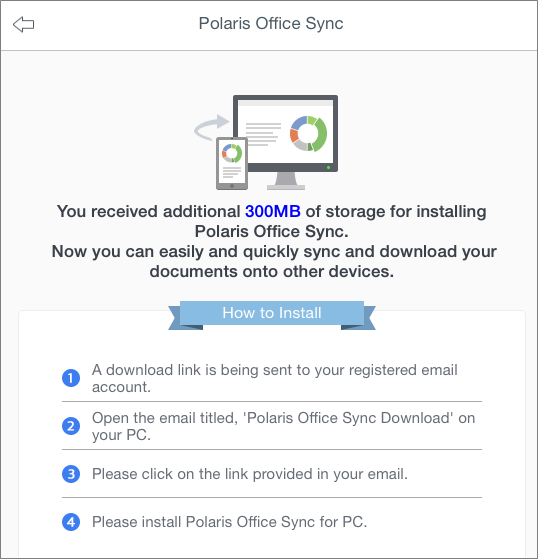 Before reviewing these instructions, did you know you could get 300MB bonus storage on your cloud if you install Polaris Office Sync? ② After installation has completed, log in and set up your Polaris Sync folder. A folder name Polaris Office will be created as the default folder, but you can also choose a preexisting folder to use for Polaris Sync. Now, Polaris Office Sync installation is completed. 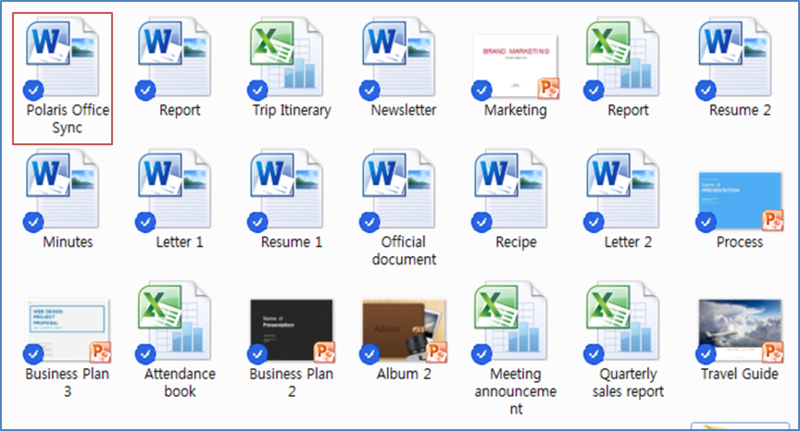 ① When you open the newly created Polaris Office folder, all documents saved on your Polaris Office cloud will already be there. 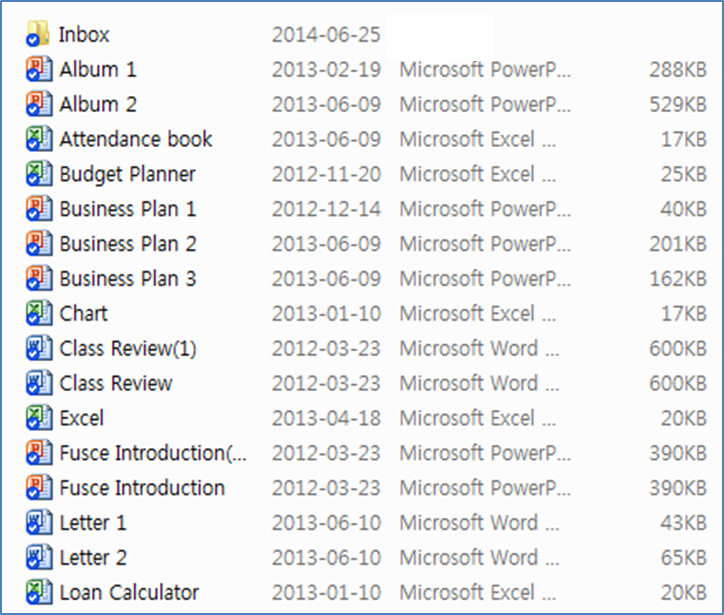 ② Documents can be simply dragged and dropped into the Polaris Office Sync folder. Files in this folder will be automatically uploaded to your cloud. Polaris Office Sync will automatically sync on all three platforms to make it easy to view, edit, and manage all your documents! – [Premium service] For extra security, the App Passcode option (direct password input) has been added. Polaris Office has been featured on Appstore! 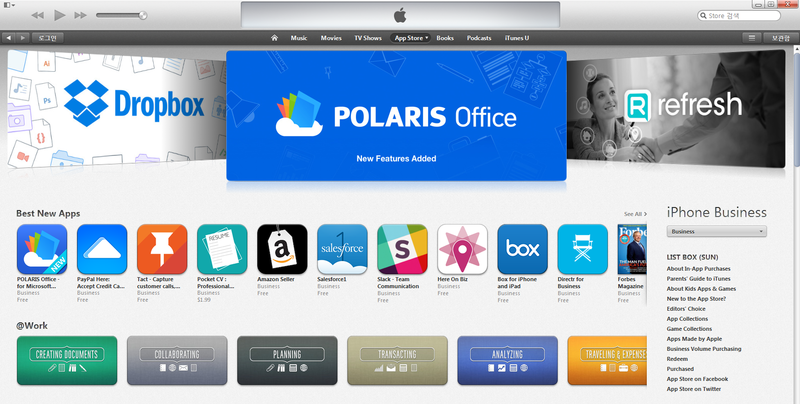 Polaris Office has been featured on Appstore Business category! Also, it is exposed in US, Korea, Japan and other 37 countries as Best New Apps! Documents in Polaris Office are safely stored! Thank you all for showing great interest in our application. – Only uses personal information for service usage and utilized under the user’s agree to the access. Moreover, personal information is not provided to the third party. – Protects personal information safely and firmly followed by the Privacy & Terms. – Saved documents are encrypted multiple times hence it is safe to freely edit and share documents! POLARIS Office Service has been launched! 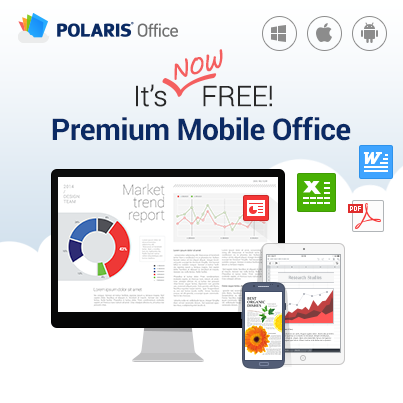 Free and Premium Mobile Office, POLAIRS Office is now officially launched on iOS, Android, and Windows Desktop! Various editing functions used in Desktop can be also used on mobile devices. 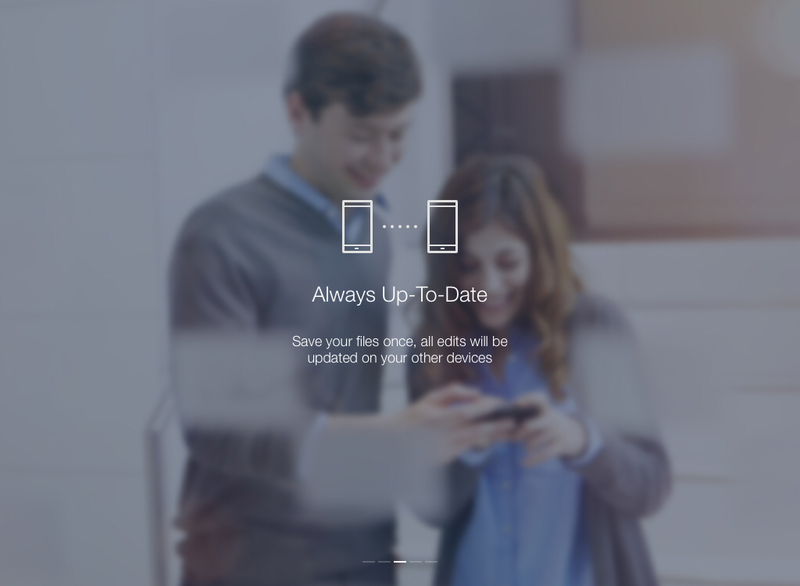 Documents saved in POLARIS Office is automatically updated on all your connected devices. The addresses of the devices are synced, which allow easy document work with your colleagues.